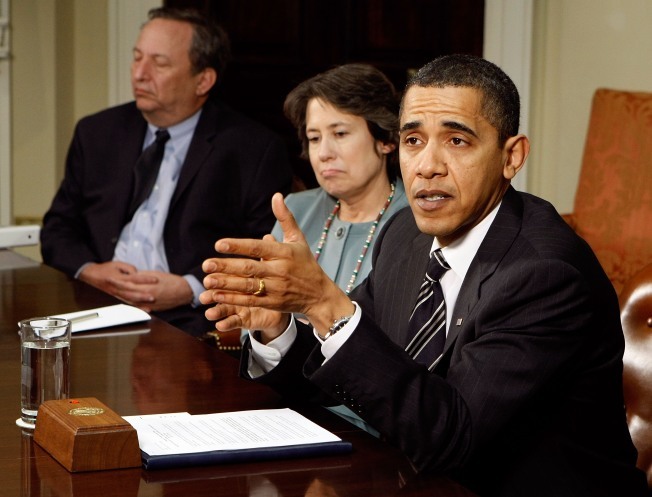 Obama: Economy Shows "Glimmers of Hope"
President Obama meets with Federal Deposit Insurance Corporation Chair Sheila Bair and and National Economic Council Chair Lawrence Summers on Friday for an update on the economy. President Barack Obama said Friday the economy is beginning to show "glimmers of hope" despite remaining under stress and signaled more steps are coming to brighten the business climate. Obama commented to reporters after meeting at the White House with members of his economic team, including Treasury Secretary Timothy Geithner, economic adviser Larry Summers and Federal Reserve Chairman Ben Bernanke. "What we're starting to see is glimmers of hope across the economy," the president said, just before noting that the economy is "still under severe stress." "Whatever we do ultimately has to translate into economic growth and job," Obama said. He said there has been a significant uptick in the number of homeowners seeking to refinance their mortgages, which will put money back into their pockets. He said a 20 percent increase last month in the Small Business Administration's largest program means that small companies, often prized as the backbone of the economy, "are starting to get money." But Obama also noted the high rate of national joblessness — which climbed to 8.5 percent of the civilian labor force in March — and acknowledged that "we've still got a lot of work to do." "We're starting to see progress," he declared, "and if we stick with it, if we don't flinch in the face of some difficulties, then I feel absolutely convinced that we are going to get this economy back on track." Obama said he and his advisers discussed the stability of the financial system, the housing market and a program to help banks clear their books of bad assets that have made normal lending difficult if not impossible. Also attending Friday's meeting were Christina Romer, who heads the White House Council of Economic Advisers; Sheila Bair, chairwoman of the Federal Deposit Insurance Corporation, Securities and Exchange Commission Chairwoman Mary Schapiro and Comptroller of the Currency John Dugan.